Street View: 15 and 14 Suppl. David Bogue started life on 16 October 1808 in East Lothian as the son of Jacob Bogue, a farmer, and Ann Johnston. According to the Oxford Dictionary of Biography, he became the assistant of Thomas Ireland, a bookseller in Edinburgh, but moved to London in 1836 to work for Charles Tilt. Tilt had his shop at 86 Fleet Street and specialised in illustrated books and lithographic prints (more on Tilt in a forthcoming post). In 1841, Tilt decided it was time to retire and, according to publisher and journalist Henry Vizetelly in his Glances Back Trough Seventy Years; Autobiographical and Other Reminiscences (1893), Tilt entered into an unequal partnership with assistant Bogue because of “his general shrewdness and steady application to business”. The idea was that Bogue would gradually pay back the money he owed Tilt for the partnership, between forty and fifty thousand pounds, and publications began to appear with both their names in the imprint. 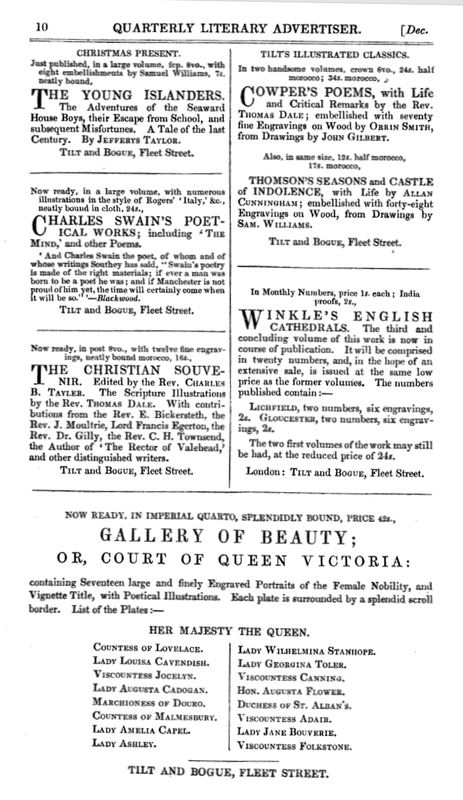 In December 1841, for instance, they had a page-long advertisement in the Quarterly Literary Advertiser announcing their latest publications. In 1843, the partnership between Tilt and Bogue was dissolved with Bogue to continue the business on his own. As the shop was within the City of London, he had to obtain the freedom of the City, but as he had not officially apprenticed to a London freeman, he had to do so by ‘redemption’ for which he paid a fine. In 1844, he married Alicia Edgar, and went to live at 39 Lonsdale Square. Alicia was also from Scotland and in 1846 and 1848, they had their children, Anne, Alicia and Charles Tilt, baptised at the United Reformed Church in Regent Square with “National Scottish Church” written above the entries in the baptism register. (1) In 1844, Bogue jointly published Isaac Walton’s Complete Angler with Henry Wix who had his bookshop just around the corner in New Bridge Street. But things had not gone well with the business for some time. Bogue was apparently not as clever a businessman, or perhaps not as lucky, as Tilt had been and had entered into a few publishing projects that did not pay off, such as his European Library, which consisted of reprints of classic titles. The first title in the series was William Roscoe’s The life of Lorenzo de’ Medici, called the Magnificent and in the preface Bogue stated that the works in the series were to consist of volumes of 450 to 500 pages on paper of the best quality and in a handsome and convenient size. 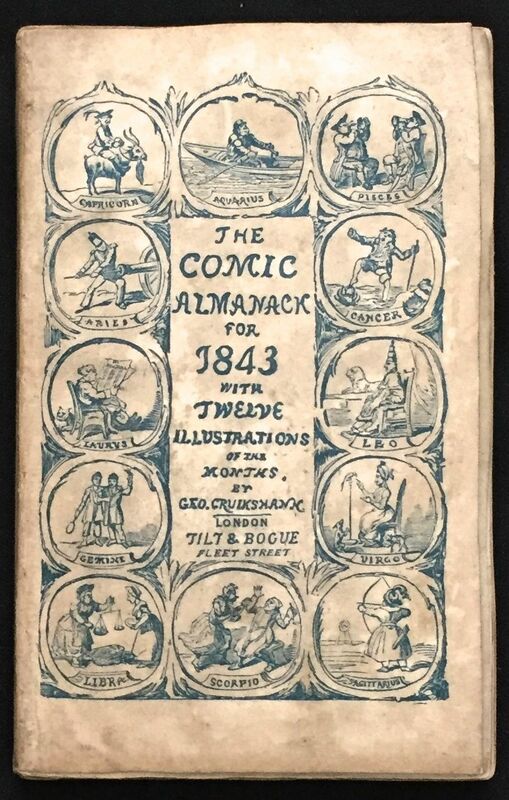 Each volume was to be bound in cloth, was to have an illustration, and was to cost 3/6, “being unquestionably the cheapest series of books ever published”. However, his main competitor, H.G. Bohn, was quick to imitate him with the Standard Library. Bogue lost his European Library to Bohn after a legal wrangle over copyright, and the series was incorporated into Bohn’s Standard Library. Bogue had one major asset, George Cruikshank, but not all of their joint ventures were successful. The temperance series The Bottle and The Drunkard’s Children flopped, and so did the Fairy Library, a series of children’s books with traditional fairy tales retold as moral stories by Cruikshank. 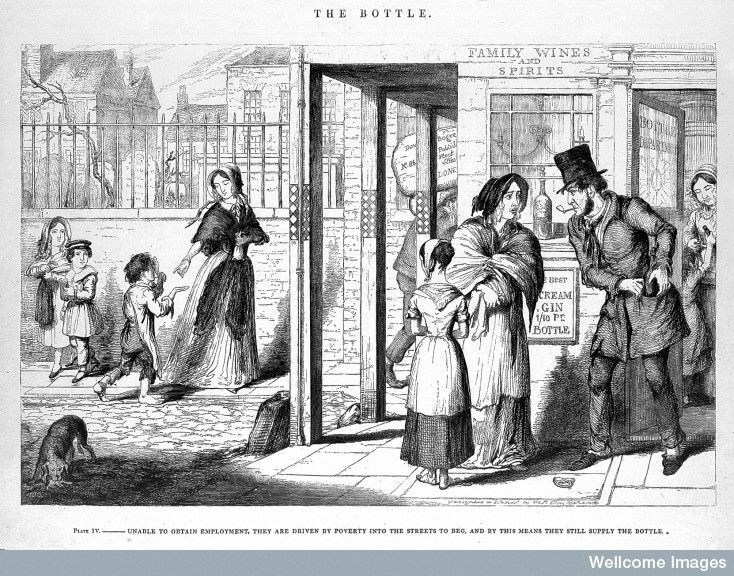 Charles Dickens took exception to the distortion of the fairly tales in his Household Words and mocked Cruikshank’s efforts to rid the tales of any reference to alcohol by ‘rewriting’ Cinderella (see here for Dickens’s text). The shop itself was a sight to behold with its large windows curving around the corner into St. Bride Avenue. It was depicted many times, sometimes with the name of Tilt on the boarding, sometimes with that of Bogue. vignette in the Tallis booklet. Bogue’s shop on the left. (1) David and Alicia were to have two more children, Edgar and David, but they were apparently not baptised at the Scottish Church. (3) More on Cruikshank and his publishers in Robert L. Patten, George Cruikshank’s Life, Times, and Art (1996). (4) The London Gazette, 4 December 1877. Solomon Barraclough was, according to Tallis, an importer of Cuban cigars. He no doubt imported cigars from Cuba, but he was in fact a general tobacconist where you could also get your daily dose of snuff, if you so wished. The first record I found of Solomon was his birth registration at Dr. Williams’s Library on 21 July 1807. Solomon’s parents were Samuel Barraclough of Postern Row, Liberty of the Tower, and his wife Anna Bere, the daughter of Barnaby Bere. Solomon’s date of birth was given as 30 March, 1796. His birth was registered at the same time as those of his brother Timothy (1792) and of his two sisters, Anna (1793) and Jemima (1798). Registering the birth at Dr. Williams’s Library showed a definite non-conformist tendency by Solomon’s parents, but he does not seem to have been too worried himself as his marriage to Mary Preston took place at Christ Church and the baptism of his son William Preston at St. Bride’s. According to the Land Tax records, Barraclough could be found at 46 Ludgate Hill from 1827 onwards. In 1844, Thomas Prout of 229 Strand, a bush and comb maker, who also ran a patent medicine warehouse, advertised almost weekly in provincial newspapers, such as The Belfast News-Letter, with his pills against gout and rheumatism. As one of the satisfied customers appeared G.E. Smith, “Assistant to Mr. Barraclough, Snuff Manufacturer to the Right Honourable the Lord Mayor”. My first instinct was to dismiss it as an advertising gimmick, but G.E. Smith most likely actually existed and is the same as the male servant listed in the 1841 census as living with the Barracloughs in Ludgate Hill (Geo. Smith, 30 years old). And in 1843, George Edward Smith testified in an Old Bailey case, where he said “I am in the employ of Solomon Barraclough, a tobacconist, in Ludgate Hill”. 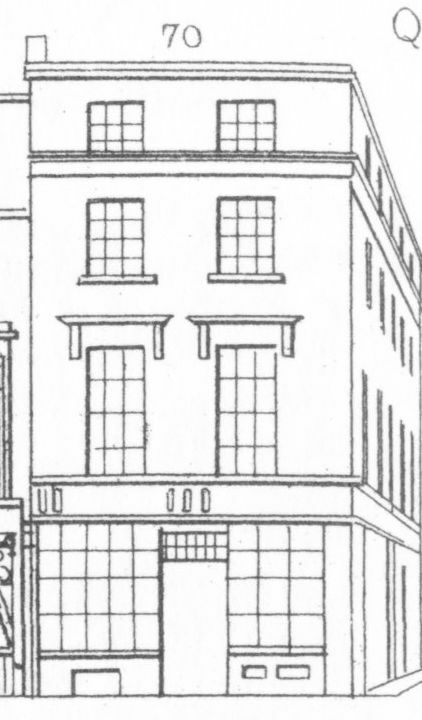 (1) Pigot’s Directory of 1839 still lists Barraclough at 46 Ludgate Hill, but by 1843 (Post Office Directory) he had extended his business to include the premises at 70 Cheapside, on the corner of Queen Street. 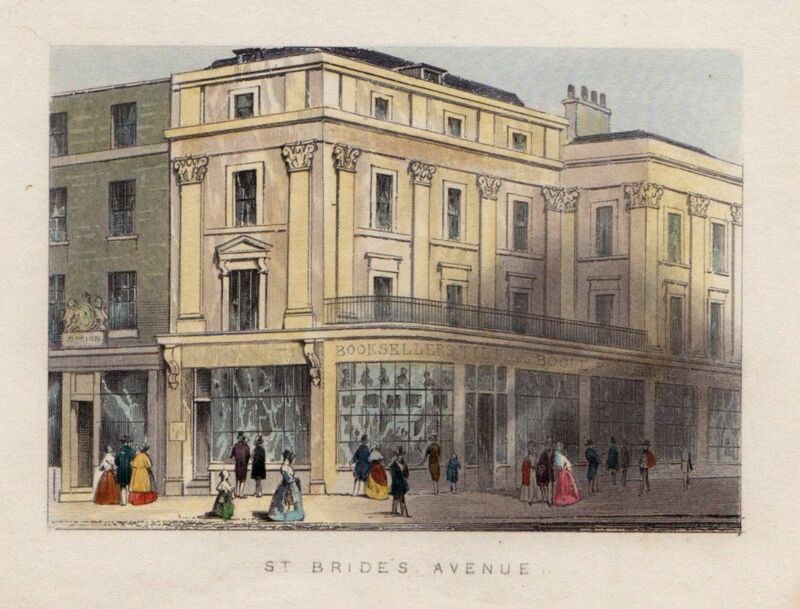 He shared this latter address with William Garratt, an umbrella maker, who, at the time of the first series of Street Views (± 1839), had shared 70 Cheapside with Sanders & Co, hatters. But, things did not go well for Solomon. Despite his apparent success in business, his personal life took a turn for the worse. His wife Mary died in August 1849 of cholera and this affected him so much that he committed suicide on the 1st of December. The inquest heard that on the morning of that fatal day, his son William heard strange noises coming from his father’s bedroom and when he went to investigate, his father was screaming and apparently trying to take hold of something in the air. His father got out of bed, but fell over and hurt his head. He was persuaded to go back to bed and his son left him to attend to the shop. His father said he would not go to the Cheapside shop as he normally did, but would stay in bed as he was not feeling well. Early in the afternoon, the bedroom door was found locked and when it was forced, they found Barraclough hanging from the bedstead rail. It was testified that Barraclough had not been himself after the death of his wife and would sit and cry for hours. A verdict of temporary insanity was returned. (2) Barraclough was buried on the 7th at St. Bride’s, as his wife had been, at, as vicar Charles Marshall noted in the register, the “Coroner’s order / temporary insanity”, thereby avoiding the refusal to the suicide of a Christian burial. In the 1851 census, we find William Preston Barraclough, tobacconist, at 46 Ludgate Hill and George Botterill, importer of cigars, at 70 Cheapside. Botterill was later to move to 33 Cheapside and in the 1861 census the property is listed as empty. William Preston is still at 46 Ludgate Hill in the 1856 Post Office Directory, and also in the 1861 census, but at some point he entered into a partnership with Henry Wilson Preedy at 129 Strand. That partnership was dissolved at the end of 1864 with Barraclough to continue on his own. (3) The 1871 and 1881 censuses for Ludgate Hill no longer show number 46; they jump from 45 to 47 without any mention of 46. As we saw in the post on Thomas Treloar‘s carpet business, the area changed considerably because of the construction of the viaduct for the London, Chatham and Dover Railway Company, with houses set back, pulled down and rebuilt. The numbering was also changed and what were numbers 46 and 48 became one new property with number 78. The old Barraclough shop was probably pulled down in 1871 or 1872 as the Land Tax records for 1870 still record it for Solomon Barraclough – they apparently never updated it to his son’s name – but in the 1871 record his name has disappeared. 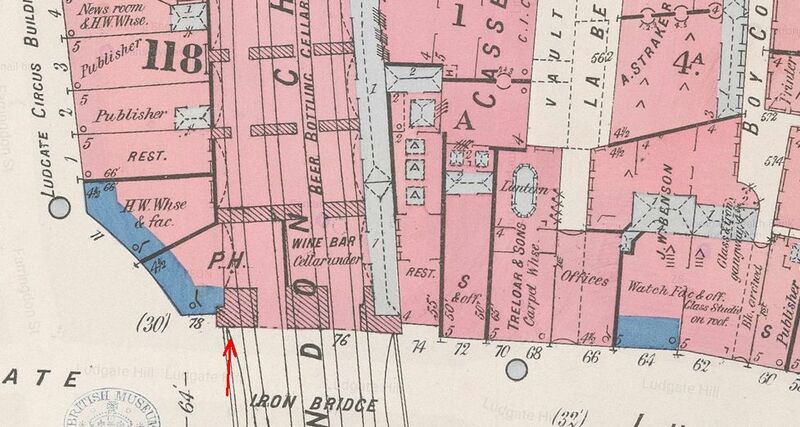 The 1886 insurance map below shows were Barraclough’s shop used to be in relation to the new situation. And William Preston Barraclough himself? No idea; he seems to have disappeared from London as I cannot find him in any of the usual places. Did he emigrate? If you have a suggestion, let me know. (1) Old Bailey case t18430508-1408. (2) Story amalgamated from various newspaper reports. (3) The London Gazette, 10 January 1865. 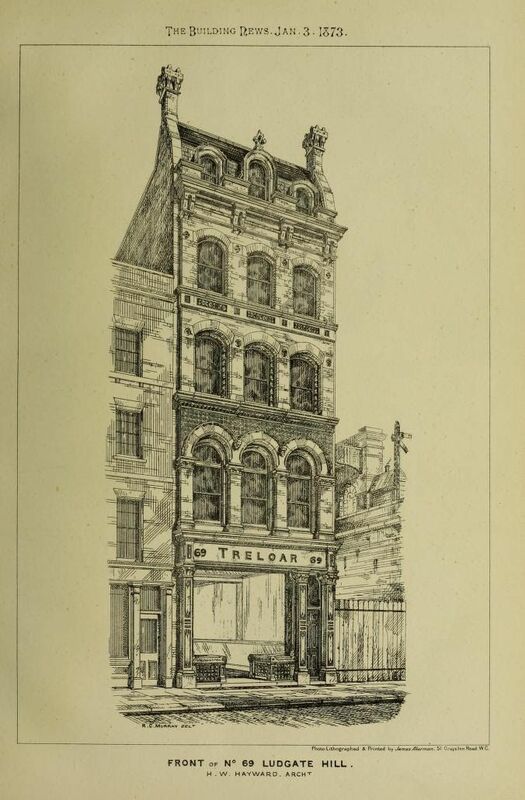 It is unclear whether Treloar ever lived above his shop in Ludgate Hill, as already in 1851, the census finds him and his growing family at 3 Dartmouth Terrace, Lewisham. When Elizabeth died in 1859, the address is given as Pitmain Lodge, Granville Park, Lewisham. 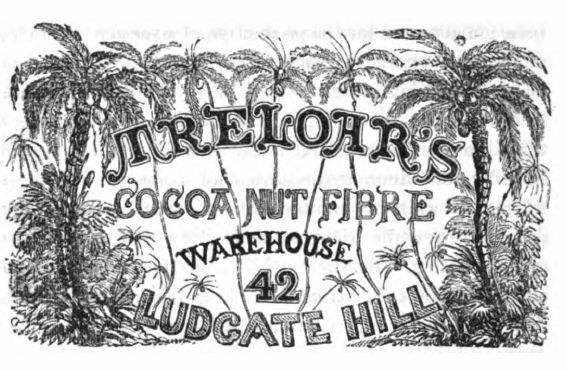 In 1861, the family is still at Pitmain Lodge with Thomas senior as coconut fibre manufacturer and all three sons, Thomas junior, William Purdie and Robert, as commercial travellers. That same year, Thomas senior married Isabella Purdie, no doubt a relation of his or his first wife, judging by the fact that her last name was used as son William’s second name. 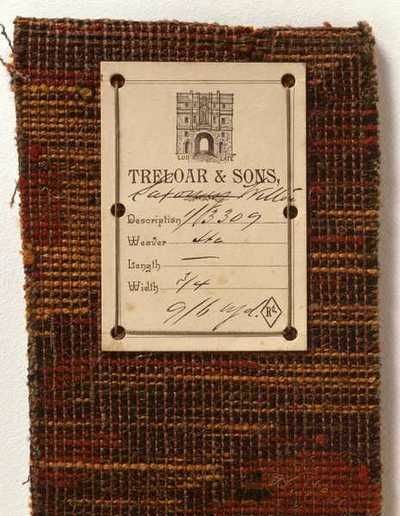 In 1862, Treloar entered some of his fibre products in the International Exhibition and from the catalogue we learn that he had already won prize medals in other exhibitions. At the beginning of that same year, on 2 January 1862, Treloar was mentioned in The Standard as having provided the matting that was laid in St. Paul’s Cathedral “by the kindness and liberality of the dean and chapter” and which would, according to the paper, “most assuredly contribute to the comfort of the numerous auditory”. For sure, one’s feet on matting in stead of on cold marble during evening service was no doubt more comfortable. 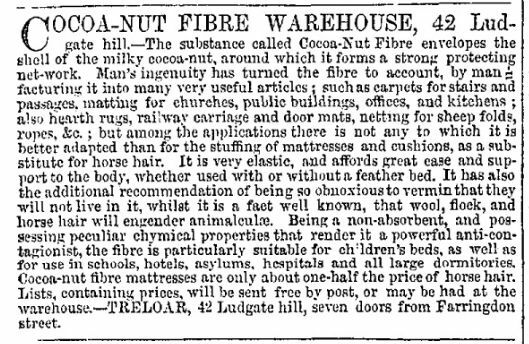 But Treloar did not just stick to coconut fibres for his floor coverings; an advertisement of 26 August in The Standard also mentions kamptulicon, India rubber and Cork cloth. And a report on the Royal Agricultural Society’s International Show in June of that year mentions Treloar’s netting for sheepfolds, coir yarn for thatching, and kamptulicon of extra thickness for paving stables and padding stalls of kicking horses. 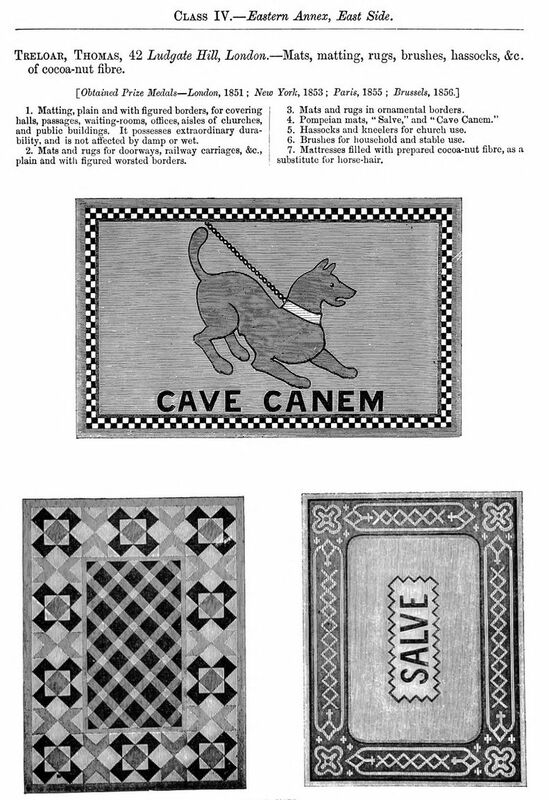 Some pieces of Treloar’s floor coverings have been preserved and the Stockholm Nordiska museet (Nordic Museum) has uploaded some images of their collection onto DigitalMuseum. I have chosen the sample you see here because it includes a label, but you can see more items here. In 1865, the Treloar warehouse is briefly listed at number 10, but later at 69 (which before the renumbering used to be the neighbouring property at number 9 and was occupied in 1847 by Harvey, a linen draper), which was across the road from the original shop at number 42. They also had premises at numbers 68 and 70, which was not the renumbered original shop at number 42 as that ended up under the new railway bridge, but the old numbers 38 and 39. The new building at nos 68/70 was designed in 1871 by J.R. Meakin for land investor Robert Pettit (information from Terence Hodgson). There was a lot of building going on at Ludgate Hill since 1864 when it was decided to allow the London, Chatham and Dover Railway Company to build a bridge across the street with the added ‘bonus’ of creating Ludgate Circus, all meant to improve traffic flow. In the twenty odd years following, property in Ludgate Hill itself was bought up to allow for the widening of the street. The houses were set back and the southern side was the first section (numbers 51-71) to be demolished. Terence Hodgson sent me an illustration from The Building News of 1873 showing Treloars new shop at number 69, for which my grateful thanks. 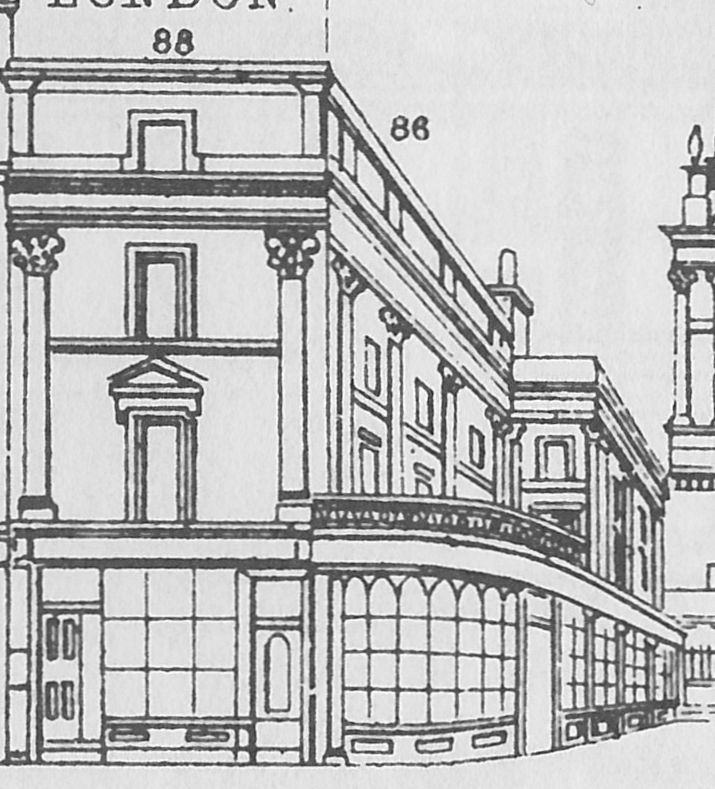 The improvement scheme of Ludgate Hill was more or less completed in 1889. 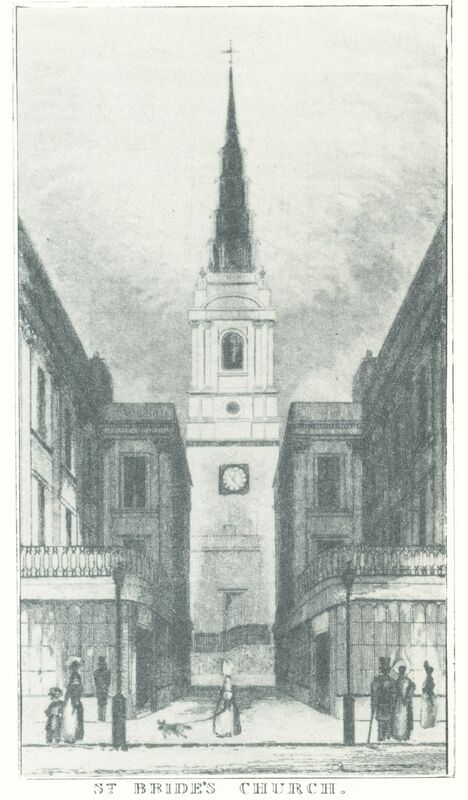 (2) See for the involvement of William Purdie himself his Ludgate Hill, Past and Present (2nd ed. 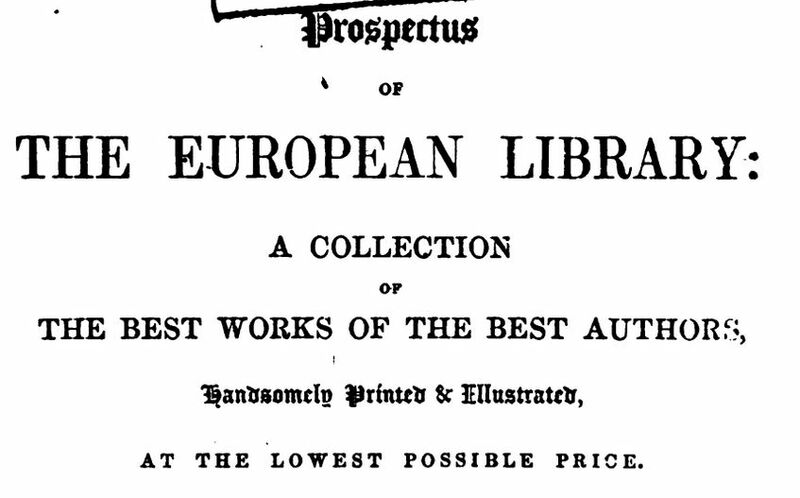 1892; online here), esp. pp. 134-141. You may remember from a previous post that Hooper’s printing business moved to 69 Ludgate Hill in 1874 or 1875. There is no clash with Treloar as the gentlemen shared the building. Treloar used the ground floor, which, by the way, extended all the way back to Pilgrim Street, and Hooper used one (or more?) of the upper floors. Goad’s insurance map of 1886 just lists the occupants as “carpet warehouse & others”, but the 1904 insurance map says “carpet warehouse, stationers’ warehouse & offices over”. The colours on the 1904 map are not terribly bright, but if you click on it to enlarge, I think you will see what I mean. 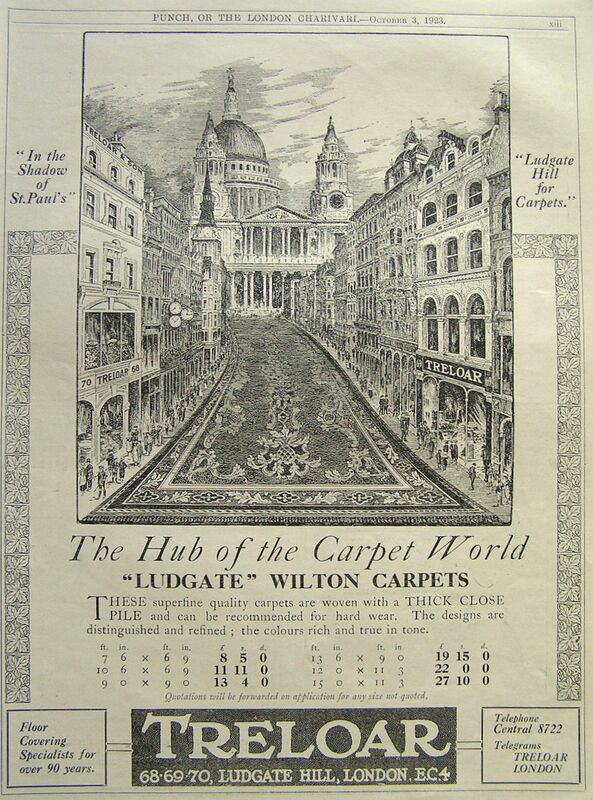 In an advertisement, Treloar’s made full use of the fact that their two shops were on opposite sides of the street by paving the street between his shops with one of their Turkish carpets. 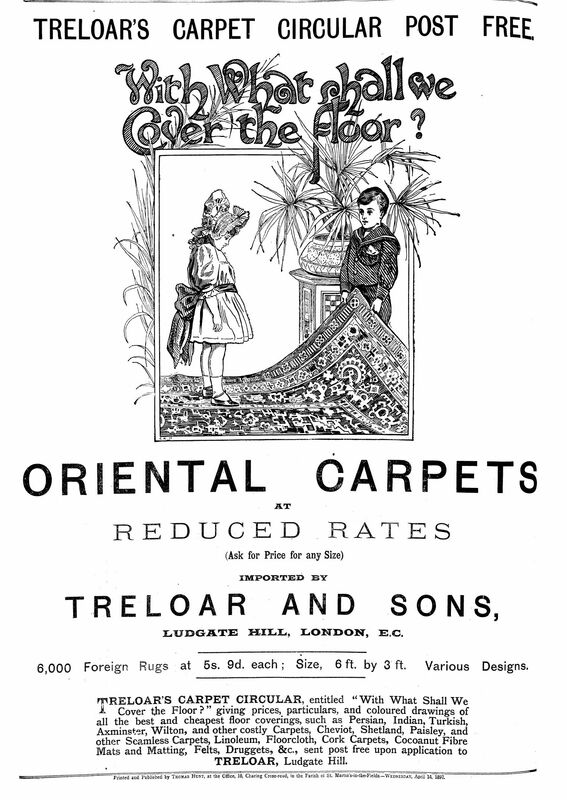 The same advertisement claims that Treloar’s were floor covering specialist for over 90 years, which would date the start of the business in 1833 or before (see bottom of this post). Well, possibly, but not at number 42 as that did not house a carpet manufacturing business before Treloar moved in. Thomas senior died in June 1876, 58 years old. In the probate record he is still described as coconut fibre matting manufacturer, so he presumably had not yet retired. (3) In 1881, both William Purdie and Robert claim their Freedom of the City by patrimony and are described as of 69, Ludgate Hill, carpet factors. They continued the business under the name of Treloar & Sons until Robert died in 1898.(4). William Purdie, by then Sir William Purdie, died in 1923(5) and that is where my story ends. I will leave you with some advertisements for Treloar. (1) The Examiner, 18 July 1846. (2) The British Architect, vol. 32, 15 November 1889, p. 343. (3) England & Wales, National Probate Calendar (Index of Wills and Administrations), 1876. Estate valued at under £35,000. Sons Robert and William Purdie were the executors. (4) England & Wales, National Probate Calendar (Index of Wills and Administrations), 1898. Estate valued at roughly £16,500. Brother William Purdie is named as the executor. (5) England & Wales, National Probate Calendar (Index of Wills and Administrations), 1923. Estate valued at roughly £36,600. Street View: 15, 3 Suppl., 7 Suppl. and 14 Suppl. As early as 1786, one Samuel Sangster is mentioned as cane merchant of Fleet Street. (1) Whether he already occupied number 94 is not certain, but that particular address is mentioned as being in the family at least since 1802. In that year Samuel Sangster, dealer in sticks and canes, insured his business against fire. (2) Samuel also appears as stick and cane manufacturer in the list of members of the Society for the Encouragement of Arts, Manufactures, and Commerce “extended to December 31st, 1818”. 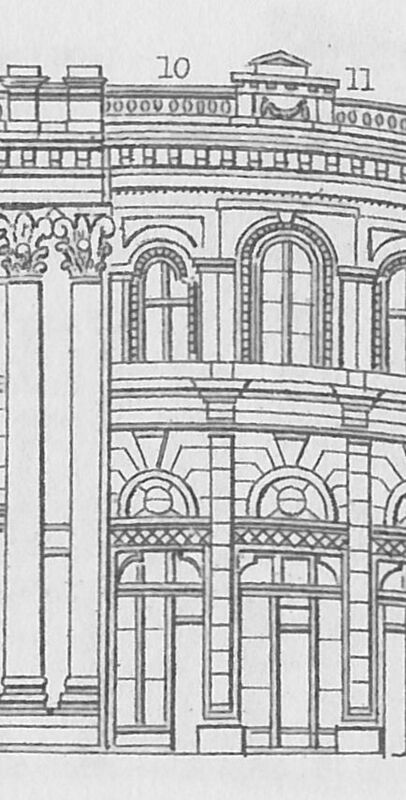 In an advertisement in Palmer’s European Pocket Guide of 1882, the Sangster firm claims to have been established in 1777 and although 94 Fleet Street is mentioned as one of their premises, it does not necessarily follow that it all started at no. 94. The Street View elevation shows the passage to The Old Bell between numbers 94 and 95. This pub was built by Christopher Wren for the builders working on St. Bride’s Church after the 1666 Fire. For centuries, the Fleet Street entrance to the pub was through this small alleyway, but nowadays the pub has taken over what was number 96 (In 1840 Hemsley’s Baby linen warehouse) and they have a proper front in Fleet street. The 1882 advert also show the other addresses where Sangster could be found: 140 Regent Street, 10 Royal Exhange and 75 Cheapside. 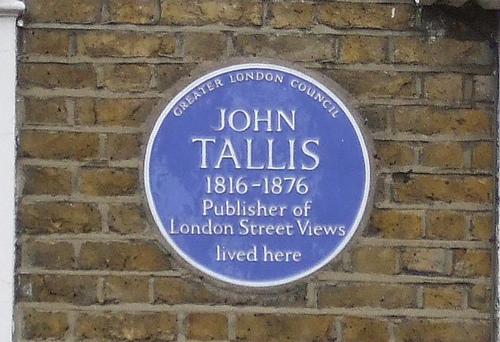 The 140 Regent Street address must have been acquired between the publication of Tallis’s first series of Street Views, when 140 was still occupied by R.H. Franks’ hat shop, and 1847 when the supplements were brought out. Samuel’s cane shop developed into an umbrella and cane shop when his two sons, William and John, took over the shop. William was born on 3 Feb. 1808 and John on 24 Nov. 1811; they were both baptised in St. Bride’s Church. (3) At some point, however, the family moved to the ‘Paragon’, a newly developed housing estate in Streatham, Surrey where they are found in the 1841-1881 censuses. The brothers called one of their umbrellas ‘the paragon’. For the ladies they developed parasols “for the fête, promenade, or sea-side”. According to London as it is Today the most important article among the stock of Sangster’s was their “Sylphide Parasol, light and graceful [… that] may now be seen in all the most fashionable drives and promenades in and about London”. The demand for this new fashion item was so great, that “the manufacturers have supplied no less than sixty thousand” of them. But one is not to forget that Sangster’s were also “the patentees of the much approved Alpaca Umbrella, of which upwards of seventy thousand have been sold”. The British Museum has in its collection a draft for a trade card which also shows the Regent Street shopfront with the canes and umbrellas displayed in the window. The shop windows could be so large because the excise duty on glass had been repealed in 1845, which allowed for far larger display windows. 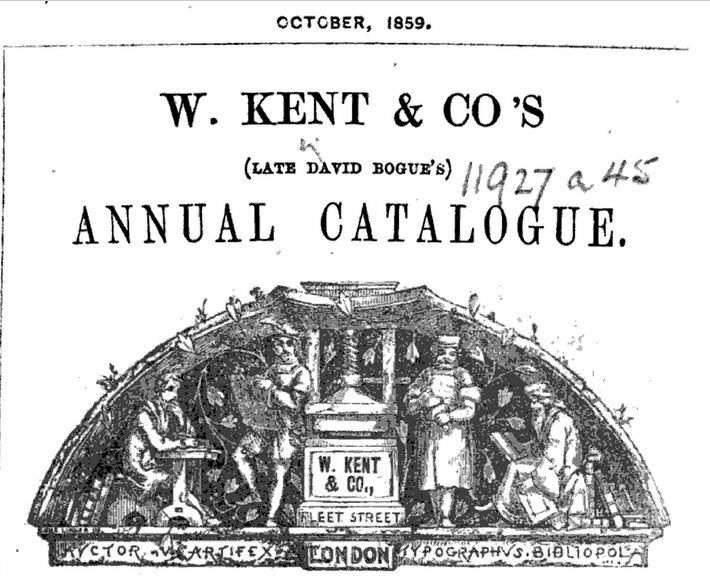 In the London Society Magazine of 1864. W. & J. Sangster announce “a large assortment of sun shades and parasols, made of entirely new patterns in Lyons silk, &c.” and lest you forget, they also remind you of the fact that they “have been awarded four prize medals for the quality of their silk and alpaca umbrellas”. 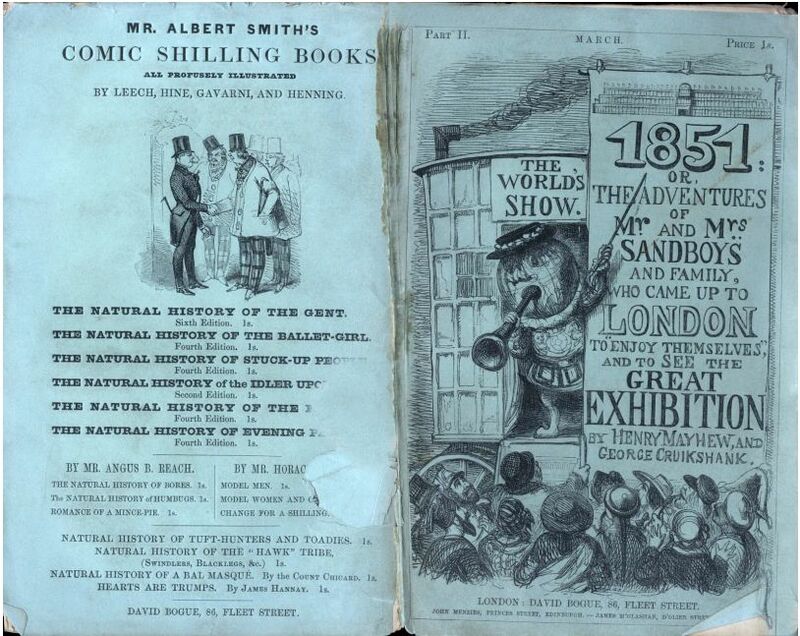 In 1855, William even wrote a book about umbrellas, Umbrellas and Their History. The illustrations were by Charles Henry Bennett (1828-1867). You can read the whole book online here if you want, but I will just show some of the pictures. William Sangster died 3 September 1888, his brother John a few years later on 17 November 1890. Their combined estates were valued at almost £83,000. (1) PROB 11/1144/256. He was buried on 31 July, 1786 in St. Bride’s Church. (2) Sun Fire Office, National Archives, MS 11936/424/727039. (3) Baptism records St. Bride’s Church: William was baptised 10 August 1808; John 10 June 1812 at the same time as his sister who had been born 17 Nov. 1809. Their mother was Harriet Cockerell and some of the baptisms of Samuel and Harriet are accidentally listed under Cockerell.